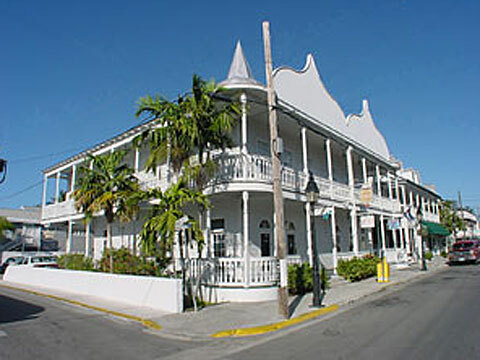 Welcome to The Key West Cuban Club Luxurious Condominiums nestled in the heart of Key West on historic Duval Street. Built in 1917 as a "Club" for Cuban Cigar Makers and their families as their "home away from home", it soon became the center of social and community life for the Cuban population in Key West. The original Cuban Club was restored in 1983 and converted to luxurious and spacious suites by Fred Salinero, a "Conch" and grandson of one of the Cuban Club founders, as well as a dedicated Historian of the Island's Cuban Heritage and Cigar Industry.Today, The Cuban Club Suites stands as an award winning historical landmark converted to spacious and luxurious one and two bedroom suites filled with all the amenities of comfortable living. Where are you located? Right on Duval Street, three blocks from the Atlantic ocean and within walking distance to most restaurants and attractions in Old Town. (check map site on Cuban Club web page). Can I bring my dog? Dogs are welcome as long as they weigh under 20 pounds and a $200 CASH deposit is made upon registration. Call or email us for more information. What about things to do ? Our Staff can help you with any concierge assistance in the Island. From bicycle rentals to deep sea fishing and diving. They are trained to assist you in every capacity. Do I need to rent a car while I'm here ? The Cuban Club Suites are centrally located in the heart of Old Town. Stores, restaurants, beaches and bars are all within walking distance. Bicycles are what the locals use to get around, and mopeds are very popular as well. Is there parking available at the Cuban Club Suites? Yes, there is off street parking for Cuban Club guests at no additional cost.